Happy new Team Stryker day! Today’s page is the combination between several notes/ideas that I had written down before I started actually writing the issue. 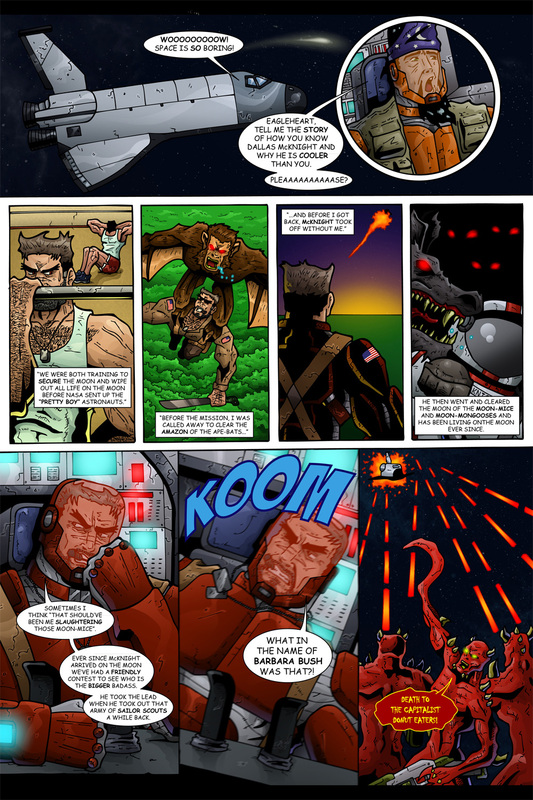 I wanted to give back story on Eagleheart and Dallas McKnight’s rivalry, show Eagleheart fighting Ape-Bats, and have Dallas fighting creatures on the moon before he claimed it for the moon. I ended up finding a way to do all of these things on one page. When writing a comic sometimes you forget that your reader doesn’t have all the knowledge of the characters as you do so it’s very important to give the readers a reason to love your characters as much as you do. Having a page of back story can turn an interesting character into a memorable one. Have a great start to the week and be sure to share this page with all your friends on Facebook and Twitter!